What is the minimum age requirement for volunteering? Full - Time: The time commitment for full time volunteering is a minimum of 2 weeks and a maximum of 4 weeks (depending on the season and determined by us). Full time volunteers live in the SACH Children’s Home for the duration of their volunteer position. Part-Time: The minimum time commitment for part time volunteering is 3 weeks and there is no maximum - we have part time volunteers that have been coming every week for several years! Part time volunteers will be assigned between 1-4 shifts (shifts are 9:00 am - 12:00 pm or 4:00 pm - 6:00 pm) for each week of their volunteer position. All shifts will be agreed upon once the volunteer is accepted to the program. During busy season (winter & summer breaks), we cannot guarantee you will be assigned more than 2 shifts per week. This is in order to accommodate all of the international volunteers that want to volunteer with us during that time. Who should my reference letter be from? Your reference letter should be from a past employer or teacher - someone who can vouch for your abilities and share a bit about you and your skills. 1) You will submit the application here with the required forms (resume/CV and one recommendation letter). 2) You will be contacted for an interview by Iris - it can take up to two weeks for her to contact you after receiving your application. If you are from the United States, you will have a follow up interview with Marissa, from SACH US. If you are from Canada, you will have a follow up interview with Jessica, from SACH Canada. If you are from neither the U.S. or Canada, you will have one interview with Iris. Why do I need to complete a medical form for volunteering? For your safety as well as the safety of the children, we require certain immunizations. This is to make sure that you have immunity against common diseases and viruses. All immunizations that we require are common for children who grow up in the developed world to receive. If you have not received any of the vaccinations that we require, you must receive them prior to volunteering. The only thing on the medical form that I do not have is a PPD test. What is a PPD test and why do I need it? A PPD test or Mantoux test is an intradermal (under the skin) test that screens for tuberculosis (TB). It is a two-step test that must be placed by a physician and then read by a physician 48-72 hours after the placement. This test is required by the infectious disease doctors that we work with to ensure safety for all involved parties. Why do I need to provide proof of insurance? This is a requirement for all volunteers. This is to ensure that in the event something happens to you while you are at the house, you have medical insurance to cover you to seek medical care. Do I need a volunteer visa to volunteer at SACH? No, you do not have to get a volunteer visa to volunteer with us. Once I am accepted and have my dates for volunteering, when should I arrive at the SACH house? Full-Time: Arrival time at the SACH Children’s Home for full-time volunteers is 10 AM on Sunday morning. Volunteer dates will always begin on a Sunday as the work week in Israel is Sunday - Thursday. This the best time for us to start volunteers, so that they have a full week with us prior to the weekend when the staff is not at the house. We begin at 10 AM because it gives us the full day to do orientation and for you to get acclimated. We budget this time into our schedules, so please arrive on time for your orientation. 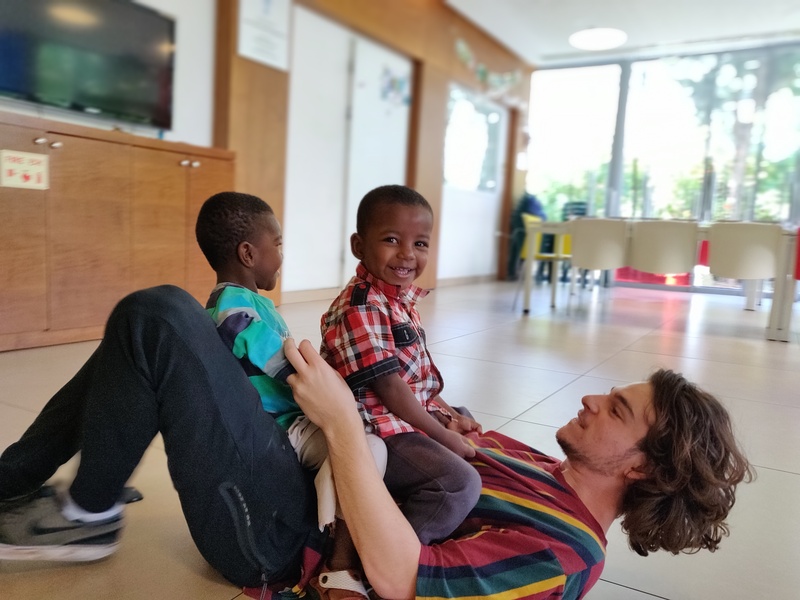 Part-Time: Arrival time at the SACH Children’s Home for part-time volunteers is 9 AM, if your first shift is in the morning or 3:30 PM, if your first shift is in the afternoon. We budget an orientation into our schedules, so please arrive on time for your first shift. What does a day look like for part-time volunteers at the SACH Children’s Home? 9:00 - Arrive, put belongings in playroom, check in with Iris to see if there are any groups to prepare for, and start an activity (there may be one already out and waiting for you depending on the full-time volunteer). 10:30 - Work with other volunteers to assess whether a new activity is necessary. 11:45 - Clean up time, work with other volunteers to engage the children to help put all of the toys away into the playroom and wipe down chairs and tables. Once the toys are put into the playroom, please have the children go to the kitchen to wash their hands for lunch. While they are doing that, please spend the last ten minutes of the shift using the wipes to clean the toys that were used in the morning. This is very important so that we do not spread any extra germs in the house. Then, please put all toys back in their proper places on the shelves. 5:45 - Clean up time, work with other volunteers to engage the children to help put all of the toys out into the playroom and wipe down chairs and tables. Once the toys are put into the playroom, please have the children go to the kitchen to wash their hands for dinner. While they are doing that, please spend the last ten minutes of the shift using the wipes to clean the toys that were used. This is very important so that we do not spread any extra germs in the house. Then, please put all toys back in their proper places on the shelves. What does a day look like for full-time volunteers at the SACH Children’s Home? You can check out a typical day at SACH here! Do full-time volunteers get any time off? When will my day off be determined? Can I ask for a specific day off? Every full-time volunteer gets one day off a week and this day is not determined until arrival at the house. This is to make sure that it is fair to all volunteers. If you have a preference for a certain day off, the best time to tell us is as soon as you arrive to the Children’s Home, as this is the first time that it will be discussed. Each Sunday, you will tell Iris which day you would like to have off that week. Are full-time volunteers provided with food? Yes. We provide basic food supplies for you to cook with at the house, such as eggs, rice, beans, pasta, seasonal vegetables and fruits, flour, and basic spices. Does the Children’s Home keep Kosher and Shabbat? No. We have people living in the SACH Children’s Home from all over the world, so the house is not Kosher, nor is Shabbat kept. Just because the house does not keep Kosher or Shabbat, does not mean that you cannot volunteer if you do. We have plenty of volunteers who keep both Kosher and Shabbat and the house is comfortable for them. Volunteers are welcome to bring their own pot/pan to cook and use ingredients in the house to do so. It is also possible to keep Shabbat in the house; Saturday is usually a relatively quiet day and there is nothing that you will be required to do that would make you break Shabbat. What is the dress code in the house? Please refrain from wearing low cut tops, short skirts, or short shorts when you are in the house and interacting with the children. We recommend not wearing expensive clothing when playing with the children – activities can be messy! Comfortable does not mean pajamas! We have many visitors and important people come to the house, so please have that in mind when you are packing. Are sheets and towels provided to full-time volunteers? Bedding is provided, but towels are not! You must bring your own towels. What is the cost for full-time volunteering? Full-time volunteers pay a fee of 100 USD per week that they stay at the SACH Children’s Home. What should I bring as a full-time volunteer? What should I prepare for my time at the SACH house? We ask that you gather ideas for your time at the house. It can be a bit of an adjustment to being in the house during the first couple days and it may slip your mind to plan activities for all of the children. The goal is for the children to do at least one craft or activity every morning and afternoon. We want you to come to the house with at least a few ideas of activities that you already have the intention of completing. Your goals and ideas may change when you get here and get a full assessment of the supplies that we have, and that is okay! What language is spoken in the house? English is the predominant language spoken at the house. The mothers and nurses who do speak English often act as translators for the children who do not speak English. Many people ask how it is possible to communicate with the children given the language barrier. The answer is that when it comes to playing with the children, laughing, smiling, and facial expressions end up doing most of the talking! What are the expectations for volunteering at SACH once I am in Israel? Are on time and present for all shifts that you are scheduled. Contribute at least one post to our volunteer blog. Clean the toys every day and sanitize all of the toys once a week. Keep the playroom neat and tidy. Are responsible for the well-being of all children in the house. Complete your #EndlessLev fundraiser no more than a month after your volunteering ends. I have a friend/family member that wants to visit me while I am volunteering. Can he/she come? You must ask Iris in advance if your friend/family member can come to the house. It is always preferred for them to come on a SACH Sunday, if there is one during your time at the house. Still have unanswered questions? Feel free to email our Volunteer Coordinator at ylcoordinator@saveachildsheart.com.